ALSO: 5. Liquid Biopsy - Fast DNA-sequencing machines are leading to simple blood tests for cancer. ALSO: 6. Megascale Desalination - seawater desalination can cost-effectively provide a substantial portion of a nation’s water supply. The helium balloons are inflated to the size they reach in the stratosphere. The “ballonets” inside are filled with air or emptied to make the balloon fall or rise. CYBERSPACE, JANUARY 11, 2016 (MIT TECHNOLOGY REVIEW) by Tom Simonite Billions of people could get online for the first time thanks to helium balloons that Google will soon send over many places cell towers don’t reach. Breakthrough: A reliable and cost-effective way to beam Internet service from the sky to places lacking it. Why It Matters: Internet access could expand educational and economic opportunities for the 4.3 billion people who are offline. You climb 170 steps up a series of dusty wooden ladders to reach the top of Hangar Two at Moffett Federal Airfield near Mountain View, California. The vast, dimly lit shed was built in 1942 to house airships during a war that saw the U.S. grow into a technological superpower. A perch high in the rafters is the best way to appreciate the strangeness of something in the works at Google—a part of the latest incarnation of American technical dominance. On the floor far below are Google employees who look tiny as they tend to a pair of balloons, 15 meters across, that resemble giant white pumpkins. Google has launched hundreds of these balloons into the sky, lofted by helium. At this moment, a couple of dozen float over the Southern Hemisphere at an altitude of around 20 kilometers, in the rarely visited stratosphere—nearly twice the height of commercial airplanes. Each balloon supports a boxy gondola stuffed with solar-powered electronics. They make a radio link to a telecommunications network on the ground and beam down high-speed cellular Internet coverage to smartphones and other devices. It’s known as Project Loon, a name chosen for its association with both flight and insanity. Google says these balloons can deliver widespread economic and social benefits by bringing Internet access to the 60 percent of the world’s people who don’t have it. Many of those 4.3 billion people live in rural places where telecommunications companies haven’t found it worthwhile to build cell towers or other infrastructure. After working for three years and flying balloons for more than three million kilometers, Google says Loon balloons are almost ready to step in. It is odd for a large public company to build out infrastructure aimed at helping the world’s poorest people. But in addition to Google’s professed desires to help the world, the economics of ad-­supported Web businesses give the company other reasons to think big. It’s hard to find new customers in Internet markets such as the United States. Getting billions more people online would provide a valuable new supply of eyeballs and personal data for ad targeting. That’s one reason Project Loon will have competition: in 2014 Facebook bought a company that makes solar-powered drones so it can start its own airborne Internet project. Google’s planet-scale social-engineering project is much further along. In tests with major cellular carriers, the balloons have provided high-speed connections to people in isolated parts of Brazil, Australia, and New Zealand. Mike Cassidy is a Vice President at Google. He is currently the Project Leader for Loon with GoogleX. Mike Cassidy, Project Loon’s leader, says the technology is now sufficiently cheap and reliable for Google to start planning how to roll it out. By the end of 2015, he wants to have enough balloons in the air to test nearly continuous service in several parts of the Southern Hemisphere. Commercial deployment would follow: Google expects cellular providers to rent access to the balloons to expand their networks. Then the number of people in the world who still lack Internet access should start to shrink, fast. That’s what was written on the boxes carried by the balloons that the secretive Google X lab began to launch over California’s Central Valley in 2012, along with a phone number and the promise of a reward for safe return. Inside the boxes was a modified office Wi-Fi router. The balloons were made by two seamsters hired from the fashion industry, from supplies bought at hardware stores. The 15-kilogram box carried by a Loon balloon has computers that act on commands from flight engineers, as well as equipment to transmit Internet connectivity to the ground below. In 2013, Google began working with a balloon manufacturer, Raven Aerostar, which expanded a factory and opened another to make the inflatable “envelope” for the balloons. That June, Google revealed the existence of the project and described its first small-scale field trials, in which Loon balloons provided Internet service to people in a rural area of New Zealand. In 2014, Project Loon focused on turning a functional but unwieldy prototype into technology that’s ready to expand the world’s communication networks. Loon’s leaders planned to buy their own space on the radio spectrum so their balloons could operate independently of existing wireless networks. But Google CEO Larry Page nixed that idea and said the balloons should instead be leased to wireless carriers, who could use the chunks of the airwaves they already own and put up ground antennas to link the balloons into their networks. That saved Google from spending billions on spectrum licenses and turned potential competitors into allies. “Nearly every telco we talk to wants to do it,” says Cassidy. Project Loon aims to change the economics of Internet access. Google has also made major improvements to its stratospheric craft. One of the most significant was developing a way to accurately pilot balloons across thousands of miles without any form of propulsion. The stratosphere, which typically is used only by weather balloons and spy planes, is safely above clouds, storms, and commercial flights. But it has strong winds, sometimes exceeding 300 kilometers per hour. Providing reliable wireless service means being able to guarantee that there will always be a balloon within 40 kilometers. Google solved that aviation problem by turning it into a computer problem. Winds blow in different directions and at different speeds in different layers of the stratosphere. Loon balloons exploit that by changing altitude. As a smaller balloon inside the main one inflates or deflates, they can rise or fall to seek out the winds that will send them where Google wants them to go. It’s all directed by software in a Google data center that incorporates wind forecasts from the U.S. National Oceanic and Atmospheric Administration into a simulation of stratospheric airflow. “The idea is to find a way through the maze of the winds,” says Johan Mathe, a software engineer working on Loon’s navigation system. A fleet of balloons can be coördinated that way to ensure there is always one over any particular area. A balloon that was intentionally burst in a test is checked for flaws. The first version of this system sent new commands to Loon balloons once a day. It could find a way for a balloon launched over New Zealand, for example, to dawdle over land until prevailing winds pushed it east and over the Pacific Ocean. Then it would have the balloon ride the fastest winds possible for the 9,000-kilometer trip east to Chile. But that system could only get balloons within hundreds of kilometers of their intended target. For tests of Internet service in New Zealand and elsewhere, the company had to cheat, launching Loon balloons nearby to make sure they would be overhead. In late 2014, Google upgraded its balloon navigation system to give balloons fresh orders as frequently as every 15 minutes. They can now be steered with impressive accuracy over intercontinental distances. In early 2015, a balloon traveled 10,000 kilometers and got within 500 meters of its desired cell tower. Google has also had to figure out how to make the balloons sturdier, so they can spend more time in the stratosphere. The longer they stay up, the lower the cost of operating the network. However, weight considerations mean a balloon’s envelope must be delicate. Made from polyethylene plastic with the feel of a heavy-weight trash bag, the material is easily pierced with a fingertip, and a stray grain of grit in the factory can make a pinprick-size hole that will bring a balloon back to earth after less than two weeks. Preventing those leaks is the work of a squad inside Project Loon that has doggedly chased down every possible cause and come up with preventive measures. These researchers have studied balloons retrieved from the stratosphere, pored over video footage of others inflated to bursting on the ground, and developed a “leak sniffer” to find tiny holes by detecting helium. The leak squad’s findings have led to changes in the design of the balloon envelope, fluffier socks for factory workers who must step on the envelopes during production, and new machines to automate some manufacturing steps. Altogether, Google has introduced the first major changes the balloon industry has seen in decades, says Mahesh ­Krishnaswamy, who oversees manufacturing for Project Loon and previously worked on Apple’s manufacturing operations. Those changes have paid off. In the summer of 2013, Loon balloons lasted only eight days before having to be brought down, says ­Krishnaswamy. Today balloons last on average over 100 days, with most exceeding that time in flight; a handful last as long as 130 days. Loon balloons can be landed by carefully releasing helium, but they pack a ­parachute for ­emergencies. Google has also made many improvements to the design of the Loon balloons’ payloads and electronics. But it still has problems left to solve. For example, Google needs to perfect a way of making radio or laser connections between balloons, so that they can pass data along in an aerial chain to connect areas far from any ground station. “It was just for some minutes, but it was wonderful,” says ­Silvana Pereira, a school principal in a rural area of northeastern Brazil. She’s thinking back to an unusual geography class last summer in which pupils at Linoca Gayoso Castelo Branco School could use the Internet thanks to a Loon balloon drifting, invisibly, high overhead. Internet service is nonexistent in the area, but that day’s lesson on Portugal was enhanced by Wikipedia and online maps. “They were so involved that the 45 minutes of a regular class wouldn’t be enough to satisfy their demand for knowledge,” says Pereira. Her school is only around 100 kilometers from a metro area of more than one million people, but its location is too poor and sparsely populated for Brazil’s wireless carriers to invest in Internet infrastructure. Google’s goal is for Project Loon to change those economics. It should be possible to operate one Loon balloon for just hundreds of dollars per day, ­Cassidy says, and each one should be able to serve a few thousand connections at any time. The company won’t reveal how much it is spending to set all this up, or even how many people work on the project. Among the upgrades Google is testing for its balloons (seen here from the rafters): using hydrogen, which is cheaper than helium, and having a motor move their solar panels to track the sun. Cassidy is also confident that his balloons will be able to hold their own against Internet delivered by drones (both Google and Facebook are working on that) or satellites (an idea being pursued by SpaceX CEO Elon Musk). Those projects are less far along than Loon, and it’s expensive to build and power drones or launch satellites. “For quite some time, balloons will have a big cost advantage,” Cassidy says. Nevertheless, Google might be hedging its bets with more than just drones: in January it invested $900 million in SpaceX. Technology is not the only thing keeping 4.3 billion people offline, though. For example, policies in India mandate that telecom companies provide coverage to poor as well as rich areas, but the government hasn’t enforced the rules, says Sunil Abraham, executive director of the Centre for Internet and Society, a think tank in Bangalore. He is also wary of Project Loon because of the way Google and other Western Internet companies have operated in developing countries in recent years. They have cut deals with telecoms in India and other countries to make it free to access their websites, disadvantaging local competitors. “Anyone coming with deep pockets and new technology I would welcome,” he says, but he adds that governments should fix up their patchy regulatory regimes first to ensure that everyone—not just Google and its partners—really does benefit. Those working on Project Loon are confident the public good will be served. They seem as motivated by a desire to make people’s lives better as by Loon’s outlandish technology. Cassidy’s voice wavers with emotion when he thinks back to seeing the delight of Pereira’s pupils during their ­Internet-enabled geography lesson. “This is a way of changing the world,” he says. A blood test to catch cancer early. Breakthrough: A blood test to catch cancer early. Why It Matters: Cancer kills some eight million people a year around the world. Everything about China is big, including its cancer problem. In some wealthier cities, like Beijing, cancer is now believed to be the most frequent killer. Air pollution, high rates of smoking, and notorious “cancer villages” scarred by industrial pollution are increasing death rates around the country. Liver cancer in particular is four times as prevalent as it is in the West, in part because one in 14 people in China carry hepatitis B, which puts them at risk. Of all the people worldwide who die of cancer each year, some 27 percent are Chinese. In December, I traveled by metro from Shenzhen to Hong Kong. There I had arranged to meet Dennis Lo, a doctor who has worked for nearly 20 years on a technique called the “liquid biopsy,” which is meant to detect liver and other cancers very early—even before symptoms arise—by sequencing the DNA in a few drops of a person’s blood. Lo appeared fastidiously dressed as usual in a sharp blazer, a habit that called to mind formal dinners at the University of Oxford, where he studied in the 1980s. He is well known for having been the first to show that a fetus sheds bits of its DNA into the bloodstream of its mother. That finding, first made in 1997, has in recent years led to a much safer, simpler screening test for Down syndrome. By now more than one million pregnant women have been tested. Today Lo is competing with labs around the world to repeat that scientific and commercial success by developing cancer screening tests based on a simple blood draw. That’s possible because dying cancer cells also shed DNA into a person’s blood. Early on, the amount is vanishingly small—and obscured by the healthy DNA that also circulates. That makes it difficult to measure. But Lo says the objective is simple: an annual blood test that finds cancer while it’s curable. Cancers detected at an advanced stage, when they are spreading, remain largely untreatable. In the United States, early detection is behind medicine’s most notable successes in applying technology to cut deaths from common cancers. Half of the steep decline in deaths from colorectal cancer is due to screening exams like colonoscopies. Lo’s hospital is involved in two of the largest studies anywhere to prove that DNA analysis can also act as a screening test. The researchers are following a thousand people with hepatitis B to see if the DNA test can spot liver tumors before an ultrasound can. An even larger study is on nasopharyngeal carcinoma, a cancer that starts in the upper part of the throat. It’s rare elsewhere in the world, but in south China men have a one in 60 chance of contracting it in their ­lifetimes. This cancer appears to be linked to eating salted fish, as well as to a genetic susceptibility among Chinese and to infection by the Epstein-Barr virus, the germ that causes mononucleosis. The role of the virus, says Lo, creates a special situation. The test he developed searches for easy-to-spot viral DNA that dying cancer cells release into a person’s plasma. The study involves 20,000 healthy middle-aged men recruited in Hong Kong, and it’s halfway done. Among the first 10,000 men screened, the researchers picked up 17 cases of cancer—13 of those at stage I, the earliest kind. Nearly all these men have now beaten the cancer with radiation treatment. The typical survival rate is less than 70 percent if patients seek out a doctor only when they have the most advanced symptoms, like a mass in the neck. “They would normally be just walking on the street not knowing that there was a time bomb waiting to go off, and now we have alarmed them,” says Lo. As he sees it, every man in south China could be screened. One private hospital in Hong Kong has started offering the test already. “We believe it will save lives,” he says. Lo’s lab is now locked in a technology race with scientists at other institutions, including Johns Hopkins University, to see if these ideas can turn into a general-purpose test for nearly any cancer, not only those involving a virus. The approach relies on gene-sequencing machines, which rapidly decode millions of short fragments of DNA that are loose in the bloodstream. The results are compared with the reference map of the human genome. Researchers can then spot the specific patterns of rearranged DNA that are telltale signs of a tumor. Lo showed me several older sequencing machines during a tour of his laboratory, located at the Chinese University of Hong Kong. He says that the next generation of DNA sequencers, some no larger than a cell phone, could allow routine screening for cancer to become less expensive and far more widely used. For the time being, the cost of the DNA test being tried out on people at risk for liver cancer is still too high for routine use. Lo notes that the fetal tests were similarly expensive at first but that prices have since declined to as little as $800. That’s led to much wider use. “The same thing should happen [with cancer],” he says. Building on the foundations put in place by doctors like Lo, commercial interest in liquid biopsies has recently started to explode. Eric Topol, a professor of genomics at the Scripps Research Institute, predicted this January that the technology, applied to cancer and other diseases, will become the “stethoscope for the next 200 years.” Jay Flatley, CEO of Illumina, the San Diego company that builds fast gene-­sequencing machines, told investors this year that the market for such tests could be worth at least $40 billion. Calling the technology “perhaps the most exciting breakthrough” in cancer diagnostics, he said his company would begin offering researchers a liquid-biopsy test kit to facilitate the search for signs of cancer. In addition to screening for cancer, liquid biopsies could be a way to help people already fighting the disease. Doctors can pick a drug according to the specific DNA mutation driving a cancer forward. Tests to identify the mutation are sometimes done on tissue taken from a tumor, but a noninvasive blood test would be appropriate in more cases. Lo told me that 40 percent of Chinese lung cancer patients have a mutation in one gene, EGFR, that would make them eligible for new targeted drugs. Cancer comes in many types, and Lo says that for each, researchers must methodically make their case that liquid biopsies can really save lives. He believes he’s close with nasopharyngeal cancer. “If you can screen and prognosticate in very common cancer types, that is the time when it will go mainstream,” he says. 6. Megascale Desalination: The world’s largest and cheapest reverse-osmosis desalination plant is up and running in Israel. Breakthrough: Demonstrating that seawater desalination can cost-effectively provide a substantial portion of a nation’s water supply. Why It Matters: The world’s supplies of fresh water are inadequate to meet the needs of a growing population. The new plant in Israel, called Sorek, was finished in late 2013 but is just now ramping up to its full capacity; it will produce 627,000 cubic meters of water daily, providing evidence that such large desalination facilities are practical. Indeed, desalinated seawater is now a mainstay of the Israeli water supply. Whereas in 2004 the country relied entirely on groundwater and rain, it now has four seawater desalination plants running; Sorek is the largest. Those plants account for 40 percent of Israel’s water supply. 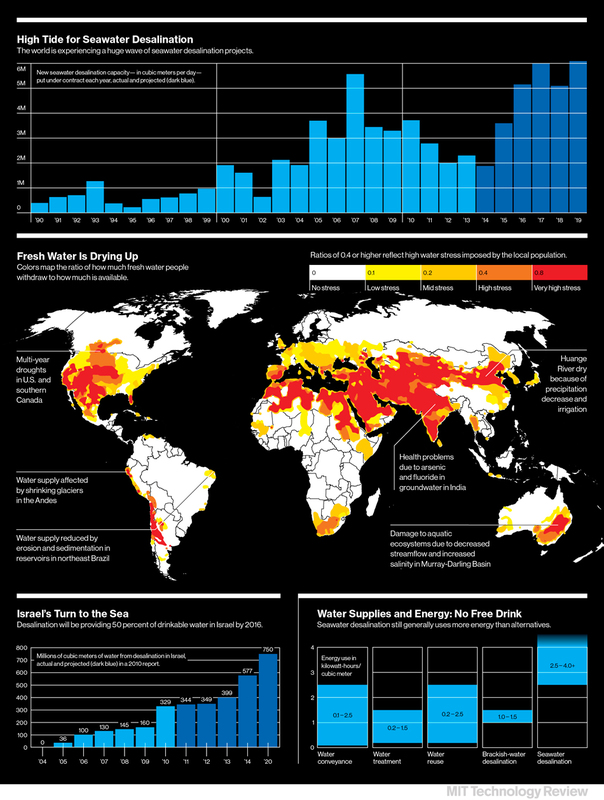 By 2016, when additional plants will be running, some 50 percent of the country’s water is expected to come from desalination. The Sorek plant incorporates a number of engineering improvements that make it more efficient than previous RO facilities. It is the first large desalination plant to use pressure tubes that are 16 inches in diameter rather than eight inches. The payoff is that it needs only a fourth as much piping and other hardware, slashing costs. The plant also has highly efficient pumps and energy recovery devices. “This is indeed the cheapest water from seawater desalination produced in the world,” says Raphael Semiat, a chemical engineer and desalination expert at the Israel Institute of Technology, or Technion, in Haifa. “We don’t have to fight over water, like we did in the past.” Australia, Singapore, and several countries in the Persian Gulf are already heavy users of seawater desalination, and California is also starting to embrace the technology (see “Desalination Out of Desperation”). Smaller-scale RO technologies that are energy-efficient and relatively cheap could also be deployed widely in regions with particularly acute water problems—even far from the sea, where brackish underground water could be tapped. Earlier in development are advanced membranes made of atom-thick sheets of carbon, which hold the promise of further cutting the energy needs of desalination plants. 7. Apple Pay: A clever combination of technologies makes it faster and more secure to buy things with a wave of your phone. Breakthrough: A service that makes it practical to use your smartphone as a wallet in everyday situations. Why It Matters: Credit card fraud damages the economy by raising the costs of goods and services. When Apple Pay was announced in September, Osama Bedier was unimpressed. A longtime PayPal executive who now runs a payment startup called Poynt, Bedier had spent more than two years leading Google’s mobile wallet service, which lets people use their phones to pay for things at checkout counters. It used some of the same technologies as Apple Pay and failed to catch on widely. So despite Apple Pay’s appealing promise—safe payment with just the press of a thumb on your iPhone—there was good reason to be skeptical of its chances, too. Yet when Apple Pay launched just a few weeks later, Bedier was a convert. Poynt makes a new kind of payment terminal—one that retailers can use to accept Apple Pay—and the advent of the service helped send the company’s orders soaring. “Now merchants have people walking in saying, ‘Why can’t I use Apple Pay?’” he says at Poynt’s Palo Alto headquarters, whose lobby displays a 100-year-old National cash register, testament to the long history of payment technologies. Originally Bedier expected Poynt to sell 20,000 payment terminals in 2015, but after the launch of Apple Pay, he scrambled to find a new manufacturer in Taiwan that could handle far greater demand. “Apple Pay will touch off a rush to mobile payment,” he says. Momentum for mobile payment technologies was building even before Apple Pay debuted last fall. Some 17 percent of all smartphone users reported making a point-of-sale payment with their phone in 2013, up from 6 percent in 2012, according to a U.S. Federal Reserve survey. In-person mobile payments in the United States more than doubled in 2014, to $3.7 billion, according to Forrester Research. Meanwhile, as services such as Uber and stores like Starbucks allow people to pay via mobile app, transactions that once brought out the wallet are disappearing into the phone, where they are faster and should be more secure. You can use your existing credit card accounts, but you never have to pull out the physical cards. “We know after people tap their phone to pay two or three times, they don’t go back to their old behavior,” says Ed McLaughlin, MasterCard’s executive in charge of new payment technologies. None of the individual technologies is novel, but Apple turned them into a service that is demonstrably easier than any other. But even if Apple didn’t invent mobile payments, it has significantly enhanced them. Just as Apple made it far easier to use a computer, listen to music, and communicate on the go, Apple Pay is all about doing the same for buying goods and services, online and off. Each financial innovation from the invention of money to the credit card reduced friction in commercial exchange and accelerated the pace of commerce. Apple Pay does that too: it marks the end of scrawling a signature, producing a driver’s license, and other hassles that came with earlier forms of payment. It’s also smoother than mobile services that came before it. Apple Pay works automatically when your phone is held up to the checkout terminal, with no need to open an app as you must to use Google Wallet or PayPal. Pressing your thumb to the phone eliminates the need to use a PIN, speeding the transaction. This is true no matter whether you’re booking a room on Airbnb or buying sandwiches at Subway. It fuses the virtual and physical worlds of commerce in a way that no other payment system has done. That doesn’t mean most of us will be ditching our wallets and waving phones in every store in 2015—far from it. The $3.7 billion worth of mobile payments made in U.S. stores last year was just a drop in the $4 trillion bucket of consumer retail spending. Beyond that, an additional $12 trillion was spent on services. Apple Pay itself faces a raft of challenges, too, and not just from rival wallets offered by Google, PayPal, retailers, and wireless carriers. Currently only people with the new iPhone 6 can use Apple Pay in stores. It’s officially available only in the United States for now, but 98 percent of U.S. stores lack the right checkout terminals to accept it. Finally, Apple Pay is far from replacing some of the things in a physical wallet—in particular, popular store rewards cards. Starbucks’s app, which is a combination store locator, rewards card, and payment engine all in one, still accounts for the majority of all mobile payments in retail stores. Likewise, Apple Pay is setting the pace in payment security, outdoing credit cards with multiple layers of protection (see “Tighter Security,” at left). The phone doesn’t store real card numbers, and even the merchant doesn’t see them, let alone keep them in the databases that hackers routinely plunder. Each transaction generates a unique code that can be used only once. The capper: the payment is triggered with Touch ID, which responds only to the owner’s fingerprint. This level of fraud protection is one reason banks representing 90 percent of U.S. consumer payments support Apple Pay, says Avin Arumugam, head of next-generation payment products at JP Morgan Chase. Most of all, Apple’s timing is impeccable. Card networks have set an October 2015 deadline for merchants to upgrade to terminals that can take credit cards with embedded chips for security—after that date, the merchants who don’t upgrade will have to eat fraudulent charges. Most of those terminals they’ll need to install will have NFC built in. Although that upgrade cycle will take years to reach most stores, Apple Pay could speed it up, says Keith Rabois, a former executive at PayPal and Square and an investor in several payment startups. “Apple Pay removes most of the barriers to adoption of mobile payment,” he says. Already, Apple Pay has taken off more quickly than Google Wallet or any other mobile payment system to date. “The time was ripe for Apple,” says Jason Buechel, chief information officer at Whole Foods Market, where almost 2 percent of store sales were coming in through Apple Pay by mid-January. McDonald’s said Apple Pay was accounting for half its mobile-phone transactions, and Walgreens’s mobile payments doubled after Apple Pay debuted. Some 60 percent of customers used it on multiple days in November, using it three times as frequently as new PayPal customers used that system in the same time period, according to a study by the brokerage firm Investment Technology Group. Apple stands to gain big if Apple Pay’s momentum continues. Not from the 0.15 percent of each transaction that it charges card-issuing banks: those fees would bring in only $2.5 billion by 2017 even if the new system got an unexpectedly large 30 percent share of U.S. credit and debit card expenditures, according to one estimate by investor Carl Icahn. That’s a tiny fraction of Apple’s fiscal 2014 revenue of $183 billion. The bigger impact will be ensuring the iPhone’s appeal. Once you’re using Apple Pay every day, in addition to other Apple services like iCloud and iTunes, you may think thrice before switching to an Android. For all the focus on Apple Pay in retail stores, its biggest opportunity in the next few years will probably be greasing payments for countless apps and services. When you take a ride with Uber, the payment happens almost invisibly, without friction. Rabois suggests that Apple Pay could bring that level of ease to thousands of on-demand services in transportation, food delivery, and more. Once people get used to making app payments with a touch, they’ll start expecting to do the same everywhere else they can.